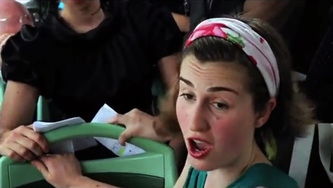 Performance, 4 singers, 14 min. Invited by Mona Schieren and Andrea Sick for the occation on the book launch of "Look At Me" at the 54. Biennale di Venezia, Italy. During the preview of the Biennale di Venezia 2009 the artist, while observing, made a detailed record of excerpts of seemingly incidental small talk. These annotations were rendered usable for setting to music in a process of weeding out and decontextualization, relating to the phenomenological particularity of this special form of a ritualized oral culture of expression. Together with composer Jeremy Woodruff, the spoken excerpts were investigated and assembled into a 4-voice song piece and musically re-enacted at the preview of the 54. Art Biennale di Venezia, 2011. 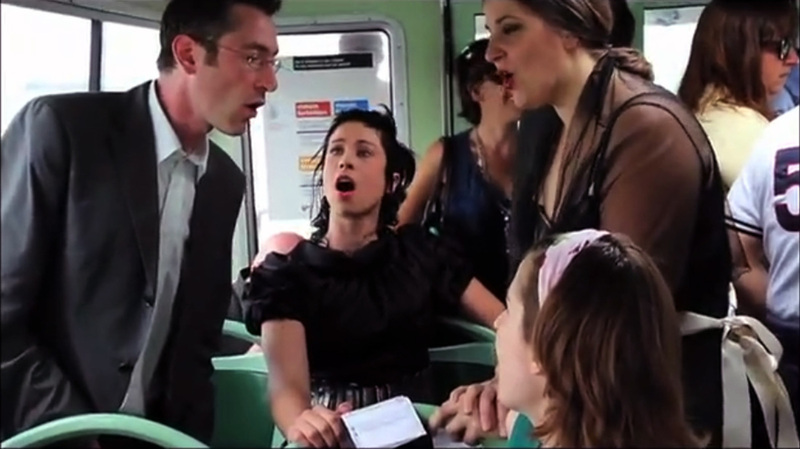 After a local Waterbus sets off, four singers perform this acapella composition. Most of the public on the ship knew nothing of the production when they board. 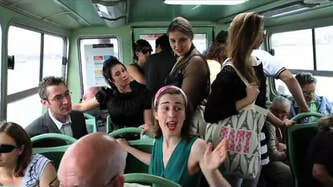 Because the Waterbus of choice travels from the residential areas to the mainland, the majority of the passengers are commuters who earn their living in the shrinking inner-city and for whom the real estate in the center of town is too pricey. Therefore they live in the areas around Mestre, Portho Maghera and Lido. Another group are professional Art afficionados that knew in advance about the production through an exclusive announcement, or whose accomodation in any case layed on the mainland. The musical form takes up elements from early secular forms of song, which already bare the traces of impulses from an exclusive kind of musical appreciation. The composition, however, also reacted to the acoustic qualities of the Vaporetti, the museum-like facade of Venice as well as the impetuses of the singers.